This month includes the shortest day of the year and a time when the sun is at its lowest angle. Even here in Florida, the shade cloth is totally off my greenhouse and has been for two months. For the past month or so some rearranging of orchids was necessary to maximize growth and avoid potential leaf burn. Jewel Orchids were moved into corners previously occupied by phals and other lower light-loving orchids because this area had become very shady. Jewel Orchid’s leaves actually develop better color under lower light, making them better exhibition plants for the upcoming winter orchid shows. Conversely, other orchids located in places that did not receive direct light are now feeling the direct rays of the sun through one side of the greenhouse. While they did not burn, leaves on some phals were yellowed indicating more light than they might like. This same phenomenon, i.e. light coming from a new direction, is a good reason for those windowsill growers to examine their orchids as well for both excess light and too little light. While temperatures here in Florida are not likely to cause cold damage close to windows, it can be a concern further north or if windows are poorly insulated. Typically, damage is not significant enough to cause plant death, but can cause flower buds to drop. One group of hobbyists does not have to worry about light angle or windows; under-light growers. They have another issue however, a need to alter day length to simulate the winter solstice. 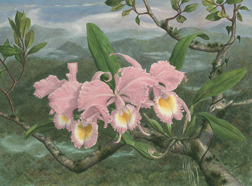 Many orchids depend not on the length of day, but on the change in day length. It will be equally important to begin increasing day length in January as this is the cue for the orchids to initiate some part of their life cycle. The first phal flowers should be opening this month if you were successful at initiating spikes with cool nights a few months ago. Multifloral paphs with mature growths are putting up spikes now too. They appreciate a little more light than most other paphs and may also need to be moved into a better location. These paphs are also initiating new growths. While a reduction in watering and fertilizing is warranted for both of these groups of orchids, do not stop altogether. If you water weakly, weekly, maintain the same fertilizer level. The reduction in watering will automatically reduce the total quantity of fertilizer you apply. It is always surprising to see high light, hot loving vandas not only growing, but putting up flower spikes in winter. They seem to handle cool nights in the mid to upper 50s with no impact as long as the day temperature warms into the upper 70s or 80s. Over the years, I have noticed that these warm loving orchids continue their growth with new leaves and roots until there is an extended cold period with little light to warm the greenhouse during the day. I continue my regular fertilizing of vandas until I notice new, green root tips disappearing. Only then do I stop weekly fertilizing and do not fertilize again until they show new root growth. Mostly, this time of year is a great time to relax and enjoy the myriads of species and hybrids that flower this time a year. If you are lucky, Santa might even bring you a gift certificate to your favorite orchid nursery.